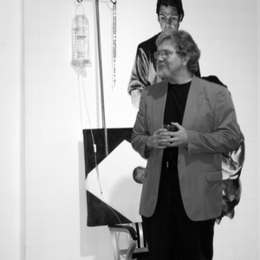 Gary Wolfe earned undergraduate degrees in Christian Ministries from Houghton College and in Psychology as well as a Master's Degree in Painting and Art History from the University of Buffalo. Gary's varied life experiences and career have influenced his art. The elderly, children with disabilities, the disenfranchised and the poor, and even more abstractly, the problem of pain, suffering and alienation have consistently informed his work. Perhaps most significantly, Gary's Christian faith has been, as he puts it, "a formative influence and formidable adversary in the spiritual inflection and tonality of my art." Gary's work has been shown in Chicago, Philadelphia, Houston, Ann Arbor, Buffalo, Rochester and other cities in the Northeast. Gary is a past-president of the Buffalo Society of Artists (est. 1891) and he continues to live and work in Western New York. His work can be seen online at www.glwolfeart.com.